When you hustle for your perfect life, you still don’t feel like enough. So you start wearing a mask. Those of you wearing masks right now know exactly what I’m saying. With your mask you get this painful truth: only your mask receives love. Maybe you made it to the “in group” but no one still really knows you—or really loves you. You still feel like you are not enough. You are probably making decisions that you right now have regrets over as you are still keeping up your hustle to stay in the “in group.” Feelings of not enough, feelings of regret, feelings of shame, feelings like you can never get off this path you are on are holding this mask up to your face. At times you feel suffocated. But you can’t leave your house without this mask. You don’t remember any other way of life. So good! The tension between those two is so real! I won’t tell you what comes next. • We want to prove to others that we’re worthy of their love. • We want to prove to ourselves that we’re worthy of being loved. • We want others not to feel sorry for us. • We fear if others see us truly, they won’t want to know us. • We want to be seen as great. • Our failures tell us the experiment of grace didn’t work. • We want to prove to God that we’re worth His choice to love us. • We believe God wants us to fake it so he looks good. • We want God to make our life work and our behavior seems like the price tag. • We think God cares more about right behavior than our trust and dependence. • We think God we’re in competition with others graded on a spiritual curve. That is real, right? Does that real slap in the face give you the the hope of possibility of a change for you? 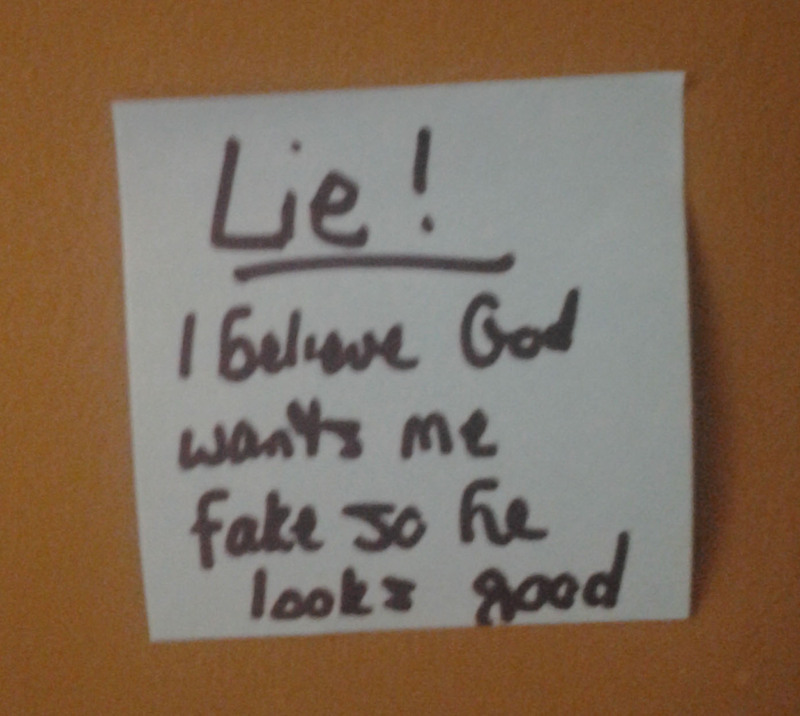 Post it in that safe place for you to remind yourself. Exposing this lie to the light of truth then makes the lie manageable. Making the lie manageable will give you the bravery to leave your house without this mask. This is brave decision upon brave decision upon brave decision until true change actually happens. So you can be loved. Not your mask. You will need to replace that lie with the truth of who you are. I know you know this. I know you’ve heard this at least one thousand times. I know you have failed at your attempts of this at least 968 times. How about this easier step to try again. Pray about it. And not just a blank prayer. Use this written prayer. Keep it on a notecard and when you reach for your phone to scroll mindlessly on, reach for this card to pray through. It will take all of a minute or two. Keep on praying this through and see if something eventually changes inside of you. It will be subtle. And then surprise you. Dear God, your word says that You are familiar with all of my ways, and yet despite what I perceive as faults and failures, I thank you that you call me pure and blameless, and that your love for me never changes. When I am busy, anxious, or stressed, your word says that you quiet me with your love. I pray that you would help me to slow down every day, and to be aware of your presence, and your love for me. I thank you that I can cast all of my cares on you, because you care for me. Help me to forget what is behind, and perceive the new things that you are doing in my life today. I thank you that you say of me: “You are altogether beautiful, my darling, There is no flaw in you.” (Song of Songs 4:7). Help this truth become more real to me that anything else that I see, hear, or feel. When I am tempted to see flaws, and doubt the beauty that you have placed inside of me, I thank you that you will help me to see myself as you see me, which is beautiful in every way.In Jesus name, Amen. This is another way to get more light onto the lie. Our son is doing that with his random posts he purposely writes for Bravester. He is living in prison which is not a safe or vulnerable place for him. As he continues to walk through healing, he has to get these lies out and into the light. That is not available in his current living situation! So he writes in a journal daily and mails that journal to us so it can’t be found in that not safe or vulnerable place. Sometimes those journal writings turn into full pages and he gives me permission to share them with you. This is him taking off his mask and being seen and loved. And he is beautiful. You may want to write. You may want to write and submit it to Your Story. You may want to start sharing honestly with your small group. You may want to join a small group. You may want to lead a small group discussion on this book, The Cure. That would be a great idea! You may want to start counseling. Yes, all of these involve vulnerability. You will be vulnerably exposing yourself. 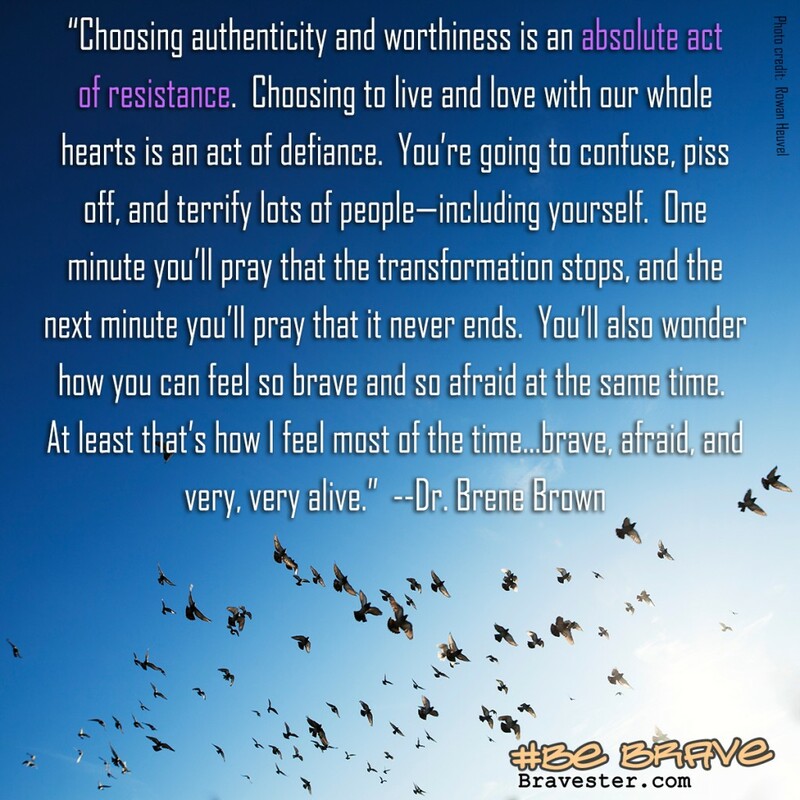 You may even be hearing a low yet loud voice inside of you saying that “you aren’t worthy to have others hear your story.” Or “no one want to know who I really am.” Or “no one will ever really like me.” This is when your mask will appear again. And feel like it is suffocating you. Lean into the vulnerability—in safe places! In safe places! In safe places! I cannot repeat that enough. And find out that you are worthy to be loved. Not your mask. Does that give you enough hope and possible joy to encourage you to lean into the vulnerability? Vulnerability is where symphonies are written. Where great stories are told. And where you are truly loved. This is scary. Fear will keep you locked up in your small world. But maybe? Maybe we will see your beauty too. You are worthy to be seen—and loved. I know this is so hard. Please try.